(TFC) North Dakota — Widespread outrage over both the construction of the Dakota Access Pipeline and violent police crackdowns rages on. That outrage is spreading even to police agencies now returning from deployment to the reservation. Two departments have already refused to return, citing personal and public objections. As if that wasn’t enough, an army of sympathizers is re-purposing social media to combat police efforts in Standing Rock. Minnesota’s Hennepin County Sheriff’s Department is among that group. Lawmakers, according to MPR News, found police activities in Standing Rock “inappropriate.” It’s to the point where they’re considering rewriting legislation to avoid future deployments to incidents like the pipeline resistance. Smith’s comments split the state’s government, however, and she was targeted. Minnesota State Rep. Tony Cornish condemned Smith for prioritizing “the rights of protesters over the needs of law enforcement,” saying she should apologize to the cops. Sheriffs from Wisconsin’s Dane County were more empathetic, pulling out and refusing to return. According to the Bismarck Tribune, Sheriff Dave Mahoney made the decision after a “wide cross-section of the community” decried the deployment. “All share the opinion that our deputies should not be involved in this situation,” says Mahoney. 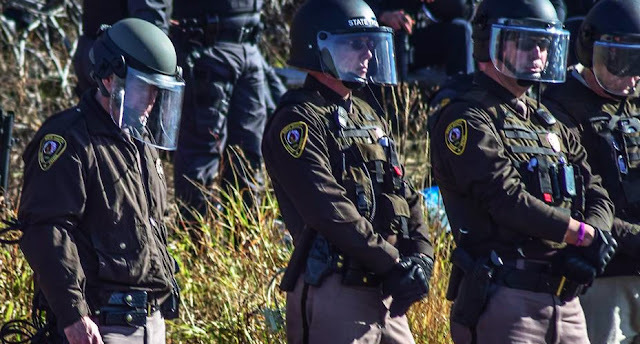 Dane County’s deputies were deployed to Standing Rock for around a week. Sources report Dane County wasn’t involved in recent arrests, a string of which scooped up an alderwoman from Madison Wisconsin. Ald. Rebecca Kemble traveled to North Dakota as a “legal observer,” filming and participating in prayer ceremonies. When Morton County officers–if they cans till be called that–grabbed and arrested her for engaging in a riot. According to Kemble, no riot was happening. Other Wisconsin departments have been recalled, with at least one staying behind for a more couple weeks. Many other citizens have been charged for trespassing and participating in non-existent riots, including journalists. One of the most renowned reporters who’s faced DAPL (Dakota Access Pipeline)-related charges was Amy Goodman of Democracy Now. Goodman’s team filmed dog attacks by DAPL contractors who lacked proper K9 licenses. The contractors have also been accused of unethical surveillance, intimidation, and sabotaging the movement by attempting to make authorities believe the protesters have finally turned violent. Other journalists, including documentarian Deia Schlosberg, face decades in prison for filming climate activists at a separate oil project. Journalists from the independent outlet Unicorn Riot, who recently reported use of a sound cannon on water protectors, have also been arrested. It began with a Facebook post, disclosing that Morton County sheriffs are allegedly using Facebook check-ins to track protesters. “Checking in” – whether you’re at a friend’s, restaurant, or escalating resistance–pinpoints your location to a tee. Once you check in, a notification is sent out to, yes, your friends, but theoretically anyone who’s capable of watching. It’s yet another tool in the bag of tricks authorities have deployed against civilians, and are likely utilizing in Standing Rock. Some detractors have dismissed the social media action as a waste of time. An editor at The Fifth Column challenged these in a Facebook post, narrating a debate on the subject he’d had. Editor Justin King pointed out that even if the check-in’s wasted two minutes of time, multiplied by hundreds of thousands, that equates to two months of wasted police work. Now imagine how ineffective the surveillance may be with millions continuously checking. Morton County Sheriff’s, Guardian reports, called claims of police surveillance misguided “rumors.” Morton County, by their own account, isn’t “monitoring Facebook check-ins for the protest camp or any location for that matter.” Before you trust them, consider that Facebook access for water protectors was reported as “blocked’ during a military-style raid on a camp.